Halloween + Core = Fun! One of the most recognizable features of the JOIDES Resolution is its derrick. This imposing tower stands 190 feet above the water line…almost 20 stories high! The derrickmen onboard routinely climb to the top to service and maintain the crown sheaves: large blocks or pulleys that form the uppermost part of the rig. The drilling line—a heavy wire rope—runs between the crown blocks and the traveling blocks in an arrangement that provides mechanical advantage to raise and lower the drill string. One of the derrickmen, Bobby, who has been working on the JR for 27 years, took three members of the science party on a rare tour of the crown, and I was amazingly lucky enough to be among them! I have spent a lot of time sailing on tall ships: climbing up the ratlines, looking out from the crow’s nest, or working on the yardarm to set and stow the sails. I am not afraid of heights; rather I find them exhilarating. So I was ready for my climb. Still, it took my breath away! We were each fitted with a safety harness and climbing device—a safety device that latches to the cables that run up the ladder and allows steady movement up or down, but will seize up with any rapid movement (such as a slip or fall). 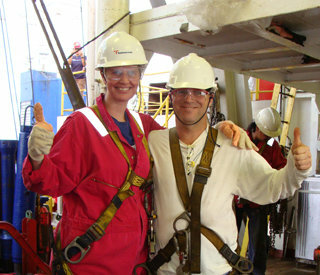 We made sure our hardhats were strapped in, and our safety goggles and gloves were on, and then up we went! The ladder is backed with a cage of rungs, so it feels a bit like you’re ascending in a tube. It was a tough climb…the derrick rises 14 stories nearly straight up from the deck. My arms were spaghetti by the time I reached the top, and I was definitely counting down to the last step. I now regret that I didn’t take a moment to look behind me while I was climbing to see the marvelous expanse of the ocean stretching out below me as I climbed higher. Once we reached the top, the climb was forgotten…the view was spectacular. It’s amazing how a different perspective can make the ordinary extraordinary. When you’re down on the deck, and even from steel beach (the top deck above the bridge), you look out over the seemingly endless ocean, but always with the ship at your back. From the crown, you can see the horizon in front, behind, and all around you, and you really feel like you’re in the middle of nowhere. As you climb higher, the movements of the ship are exaggerated, but luckily it was a fairly calm day, so there was no more than a gentle sway back and forth. It was like a vacation from the confines of the ship, which seems to grow smaller every day that we’re out here. It was refreshing. The climb was energizing, the breeze gentle and cool. We all agreed we could have stayed there all day. Bobby completed his tasks while we three looked around. Down to the bow, down to the helicopter pad. Down to the wide Atlantic Ocean. At one point I looked up and saw the moon, bright in the last glow of the afternoon sky, and I wondered that anything could be higher than we were, and thought about how much closer I felt to it. We sat for a bit and chatted with Bobby about the JR, his job and his family back home. But all good things must come to an end, and as the sun sank toward the horizon, so did we descend back down to the deck. I was happy to discover that going down was much easier on the muscles! We made a short stop to see the monkeyboard, a platform where derrickmen like Bobby work when tripping pipe. When we finally got back down toward the deck, the breeze dissipated and the temperature went up by a few degrees. We rejoined our friends and colleagues, but with a renewed sense of energy and a grin from ear to ear. I am terribly lucky to have been a part of this excursion, and I sincerely thank everyone who had a part in making it happen! I would also like to thank those who took pictures so that we could share this experiences with you, including Bill Crawford (IODP), Adam Klaus (IODP), Lisa Crowder (IODP), and Amanda Haddad (USC).